He feels really bad about it. The Five of Cups represents the fact that sometimes we do stupid things that we really, really regret later. 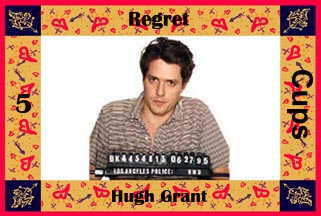 We assume Hugh Grant regrets "The Incident". For sure he regrets getting caught. The message of this card is: Think before you act. Hugh Grant sees the error of his ways at 1995 YEARBOOK: Hugh Grant and Elizabeth Hurley.